In case you missed the news bulletins on the Canadian Broadcasting Corporation, I was in the Tout Wars AL-only auction in New York on Saturday. Tough competition, with a bunch of very fine and experienced players, with many titles under their belts, plus me, with many jelly doughnuts under mine. And now my task is to write about it. And since I’m never sure how to organize these post-draft discussions, I’ll keep it loose and just offer some observations on how it went. I had set a budget with a $40-$35-$28-$26-$24 structure for my top five hitters, and a $30-$25-$5-$5 for my main starters, with a $9 slot for a closer. I set my RotoLab draft software to 69:31 hit-pitch split, which is pretty usual for the league. I also tweaked the “top-middle distribution sliders,” which sounds adjusters on the machine that injects the jelly into doughnuts. I adjusted the two sliders (one each for hitters and pitchers), towards the Stars-and-Scrubs end until I ended up with Mike Trout at $51, Chris Sale at $39, and a pretty decent lemon-filled cruller. Trout went third overall for exactly $51 and Betts right after for $44, a $3 bargain. I didn’t want to push Betts to $45, so after Jose Altuve went for $35, right at value, I felt like I got decent value when I snabbed Jose Ramirez with the sixth pick for $42, a $3 bargain. 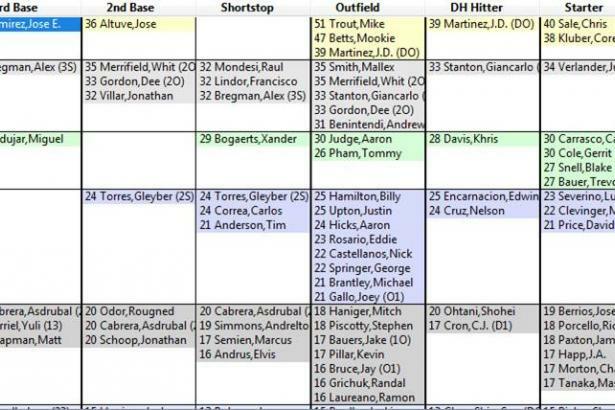 Funny side note: Last year, I didn’t buy any hitters until the likes of Justin Smoak and Yoan Moncada, while Doug Dennis adopted an extreme hitter-pitcher split and didn’t buy any top pitchers at all. Shortly after I got Ramirez, Doug started his draft roster with two straight pitchers, including Sale for $39. Jeff Erickson said, “Davitt buying a hitter and Doug buying pitchers! Cats are running with dogs!” And then something about the apocalypse being nigh. It was pretty funny. The best thing about live drafting is the wisecracking. The draft moved along with not many real surprises. One came when new league-mate Howard Bender paid $45 for Aaron Judge, whom RotoLab had pegged at just $30. About 20 picks later, another little burst of three closers in five picks: Alex Colome (#54, $13), Cody Allen (#57, $14), and Jose Alvarado (#58, $13). The last $40 player fell at pick #27, when Giancarlo Stanton went to Nando Difino for $40 on the nose, and the last $30 player went all the way down at #47, when Alex Bregman fetched $35 from Erickson after spirited bidding that included past champ Larry Schechter, Bregman’s uncle. The last double-digit player was Zack Cozart, who went for $11 at pick #186 to Erickson. 3B Jose Ramirez (pick #6, $42 bid, $45 RotoLab value, +$3 gain): I had a $40 top budget slot for a foundational five-category player to start my team. Ramirez suited me, in that even at $2 over budget, he was $3 under value. I also value position versatility, and used it late in the draft, moving Ramirez to MI to accommodate a late-game CI. 2B Jonathan Villar (#18, $28, $33 +$5): He wasn’t a target, but I bid on the price. I think/hope the HQ projection of 45 bags could be 10-15 low. SS Gleyber Torres (#28, $25, $25, +$0): I also prioritized IF spots, and Torres is a solid four-category guy in a stacked lineup. The 10 pSB help, too. ... SP Jose Berrios (#33, $25, $19, -$5): My first outright value loss, but I was happy about it when Mike Clevinger went for $26 a pick later. I’d rather have Berrios, and I do have him in another league. By the way, I was really leaning towards AL Central pitchers for these slots. Nineteen games each against DET, CHW and, especially, KC has to help the numbers. OF Andrew Benintendi (#59, $33, $31, -$2): He was the last top-flight all-rounder. I had a separate little budget sheet going on my tablet, which let me feel like I could afford to be aggressive on Benintendi to fill the $35 budget slot, saving me $2 on the slot although losing $3 on value. C Mitch Garver (#89, $6, $1, -$5): Ugh. This is what it’s come to. Six dollars for just enough OBP to make him less awful than other options. CL Shane Greene (#108, $9, $8, -$1): I did OK in last year’s draft buying Fernando Rodney for $7. Greene’s decimals stink, but DET’s few saves should start out in his ledger. Someone at draft said the worry would be Greene getting traded, which made me think his unimpressive stats might help me—which MLB playoff contender looking for bullpen help wants to trade for a guy like Greene when there are so many better options? OF Max Kepler (#112, $15, $15, +$0): I liked this pick. To me, Kepler has some unrealized potential. In fact, I wrote a long Facts & Flukes Spotlight piece on him a couple of years back. Ironically, I said at that time that Kepler was unlikely to realize his potential. Ah, whaddya I know? OF Avisail Garcia (#140, $7, $13, +$6): As the pickings were getting slimmer, I needed an OF with power, and Garcia could provide it. SP Mike Leake (#156, $5, $7, +$2): At about this time, I had those two $5 SP slots open and some $1 and $2 slots for everything else. I didn’t want to pay $5 for any $1 pitchers, so I just bid on every pitcher projected over $5 and hoped I’d get two of them. I did, and Leake was the first. 1B Justin Bour (#158, $11, $10, -$1): I sneaky-liked this pick. I needed a 1B and sure didn’t want Chris Davis. Bour’s LH power has crushed RHP the last few years, and that could play in Anaheim, where they’ve lowered the HR line. SP Mike Fiers (#160, $5, $9, +$4): See Mike Leake. This made three players for me in five throws. Fiers got off to a great start in Japan, giving up 5 runs and 6 baserunners in three innings. RP Ryan Tepera (#181, $1, $1, +$0): If TOR falls out of the race as I expect, they might dangle Ken Giles. Someone has to get the saves, right? I know about Bud Norris, but Tepera was a $6 pitcher last year with 5 wins, 7 saves, useful decimals and a 100+ BPV. C Kevin Plawecki (#188, $2, $1, -$1): Ugh, again. The best thing about this buy was that Glenn Colton had nominated Plawecki for a buck, and when I bid two, he looked at me with a frustrated expression and said, “Really? !” That got a laugh from the table. A few minutes later, I nominated someone for a buck, and Glenn bid two. I imitated his “Really? !” right back at him and got another good laugh. Hey, when you’re buying negative-value catchers for $2, you appreciate any laughs you can get. UT Ji-Man Choi (#223, $5, $11, +$6): Not long before the auction, I read that Choi had been named the regular 1B in TAM. That could help because I had filled my CI spot with a real longshot, as you will soon see. HQ projects Choi to 20 HR/.335 OBP. SW Hector Rondon (#236, $1, $3, $2): Not many Touts fill the swingman role with pitchers. Including me. I was surprised to get crickets with this throw, since Rondon is next in line if anything goes awry with Osuna. In the meantime, I can use him to stream out my $1 dart-throw starters during tough matchup weeks. CI Hunter Dozier ($1, $5, +$4). A hope-someone-else-bids throw that became a dart throw. I know the projection is for a $4 profit, but I don’t see how he can get any value at all. OF Jorge Bonifacio (#255, $1, $3, +$2): Yes, I know. But a one dollar player giving 300 ABs is like a $20 player giving 6,000 AB, right? Right? Ah, maybe not. On Tuesday, he got sent down to Triple-A. So, that’s my team. As always happens, I project to be at or near the top of the table in RotoLab, which uses HQ projections. But that’s what everyone says. I am heartened that both of the projection systems at OnRoto.com have me a solid third within easy range of the leader. Of course, other projections, other results. Have a good draft if you have a draft left. Me, I’m done drafting for 2019. Time for that lemon-filled cruller!